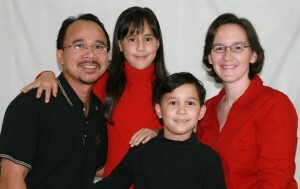 Our church supports two missionary families – the Clementes in Taiwan and Southeast Asia and the Reynolds in Guatemala. We encourage you to financially support these families if you are able, but, most importantly, we ask that you pray for them as they spread the Word of God throughout the world. Read on to learn more about their different ministries and the different ways you can pray for them. David, Sarah, Carmen and Jacob Clemente are our missionaries to Taiwan and Southeast Asia. The Clementes vision is to provide missions training that empowers local Asian communities to participate in God’s harvest. Dr. David Clemente is a professor at Holy Light Theological Seminary, teaching missions and theology courses. He mentors students in the classroom and on seminary mission trips. He also advises local church pastors as they engage in cross cultural ministry.